Cuts to tax credits will cost low-paid working families £1,300 a year. £1,300 is a "rough" estimate of the average reduction in income next year (2016/17). "The Tory conference was a feast of spin and deception. Fake claims to be on the side of working people while robbing three million low paid families of £1,300 a year with the Tax Credit cuts." Upcoming changes to working tax credit will reduce the incomes of all households that currently receive it. Fewer will be eligible, and those who continue to receive it will be entitled to less than they would have been. In the year from April 2016 working households are set to lose around £1,300 on average, according to a "rough estimate" by the House of Commons Library. That's based on spreading the expected £4.4 billion reduction in spending over the 3.3 million working households that currently receive tax credits. Some families will be more affected by this than others. The biggest reductions will be for the current recipients with the highest incomes. The government has argued that the important thing is to look at the cuts as part of a wider package of changes, most prominently a higher minimum wage and personal tax threshold. At the moment each household gets a maximum amount in working tax credit depending on its circumstances (for instance whether it contains children or a disabled adult), and on hours worked. Once a household's income rises above £6,420 a year, the amount is reduced from that maximum by 41%. So for every £100 extra earned, £41 of working tax credit is taken away. From April, only those earning £3,850 or less will be entitled to the maximum amount. And that amount is to be frozen, meaning its spending power will be reduced. For those earning more than the threshold, reductions will now be at 48% instead of 41%. The more a household earns, the bigger the total reduction in their working tax credit—some of the highest earning recipients will no longer be entitled to it at all. Child tax credit is also set to change. The income claimants can have before they start to see payments reduced will fall from £16,105 to £12,125, and the rate of reduction will also rise from 41% to 48%. And from April 2017 new claimants won't get the "family element" part of the credit and will only receive payments for their first two children. The Office for Budget Responsibility predicts savings of £4.4 billion from the lower thresholds and the increase in the rate of reduction of working tax credit (from 41% to 48%). That doesn't include the changes that affect new claimants only. The House of Commons Library has divided that £4.4 billion between the 3.3 million working families who receive tax credits to arrive at the £1,300 estimate. That calculation assumes that the savings will fall predominantly on working families. 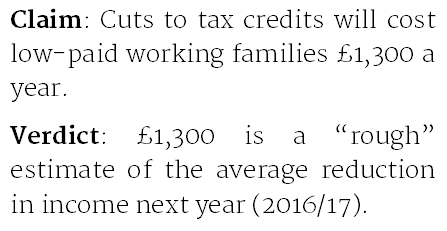 The thinking is that the reduction in the child tax credit threshold will affect very few non-working families, because not many will be earning above £12,125 anyway. In practice we don't know how many will be affected. As the Library points out, less than 3% of such families earn more than the current threshold of £16,105. What we don't know is how many are earning between £12,125 and £16,105 and so will receive less in child tax credit. That's one of the reasons the Library has been careful to emphasise that the estimate is a rough one.